A 91-page audit was recently released by Auditor General Eugene DePasquale regarding the need for Pennsylvania’s Department of Health to buckle down on enforcement in nursing homes. The audit, as reported by abc27, involved 13 findings and 23 recommendations. The Department was reported to have shirked their duties when it came to documentation, following proper protocol and enforcement. In turn, this carelessness led to the neglect of nursing home residents as well as unsanitary conditions. One resident in a nursing home was found by family to be unclean, malnourished and overmedicated. This all led to hospitalization, and eventually, death. Instead of an impactful and comprehensive punishment, the Department of Health merely cited and fined the home, while putting them on a temporary license. Another issue found in the audit was the lack of proper care time. 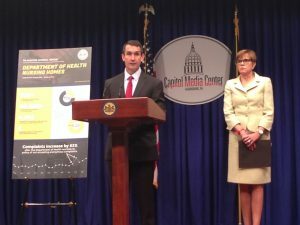 Pennsylvania mandates that each resident receive at least 2.7 hours a day of direct care, with the federal recommendation being 4.1. However, some workers in certain PA nursing were found providing less than the required and going undocumented. Thankfully, anonymous complaints about nursing homes are once again permitted after being banned, and investigations of homes are becoming more thorough. Additionally, penalties and fines are becoming more serious. A task force created by the Department of Health will continue to make improvements and reports will be released later this summer.